On An Overgrown Path: The composer conducts - badly? The composer conducts - badly? In the summer of 1919 John Barbirolli was a member of the orchestra for Diaghilev's second post-war season of the Russian ballet ... His particular memory of this season, apart from the pleasure of playing in Stravinsky's Firebird and Petrushka, was of Diaghilev's insistence that Manuel de Falla should conduct his own ballet, Tricorne. Despite the composer's protestations that he was not competent to do it, Diaghilev almost dragged him to the pit at rehearsal. After a few bars they reached some cross-rhythms. Falla stopped beating so the orchestra stopped. 'No, no,' he cried, 'you go on.' He was totally unable to conduct the rhythms he had devised - from Barbirolli the authorised biography by Michael Kennedy. 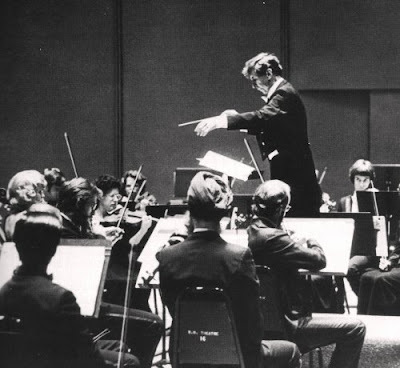 No, my header photo is not Manuel de Falla; it's Michael Tippett conducting in St Louis in 1968. On March 2 I am playing a recording of Tippett conducting his Second Symphony on my Future Radio programme. Composers have rather a chequered history of conducting their own music, and Elgar, Stravinsky and Copland all received varying reviews for performances of their own works. In his autobiography Those Twentieth Century Blues Tippett confesses "But I don't have the real conductor's technical proficiency ... the main hazard I find is that I begin to listen to the playing as a composer and not as a conductor - which means I can lose my objective control of the performance: and I have to train myself not to go that way". Tippett's Second Symphony is a notoriously difficult work to perform and the first performance in 1958 under Sir Adrian Boult actually broke down when the BBC Symphony Orchestra's string section lost its way in the complex first movement. But despite the difficulties and his own reservations about his conducting technique Tippett's own version, which was made with a somewhat more secure BBC Symphony Orchestra in 1993, has the Beethovenian energy that is manifestly lacking in Richard Hickox's later, and acclaimed, interpretation on Chandos. But, although Tippett's own recording is very fine, it wouldn't be my first choice; that accolade would go to Colin Davis' electrifying 1968 performance which still sounds fantastic on my Philips LP pressing. The timings of the two versions says it all, Tippett 36' 54", Davis 33' 29"
But judge for yourself how the composer conducts at 5.00pm Sunday March 2 UK time on Future Radio, with a transatlantic friendly repeat at 12.50am Monday March 3. The coupling with Tippett's Second Symphony is Arcangelo Corelli Concerto No 8 in G Minor 'Christmas Concerto'. Check the right-hand side-bar for the audio feed. YouTube offers Tippett conducting The Midsummer Marriage, Stravinsky conducting The Firebird and best of all Elgar conducting the Pomp and Circumstance March No. 1.